It might seem unusual to start thinking about air conditioning in Athens, GA at this time of the year, but it can actually be one of the best times for a new AC installation. Why? Simply because no one is worried about AC at this time of year! Even if your HVAC technician can’t get you booked for installation until another week, you’ll be in great shape. Think about if it were in the middle of summer and you desperately needed a new AC—every moment you wait in the heat is agony. That being said, we see no reason you can’t think about AC installation in the cold season. We’ll even give you some ideas on how to start thinking about it so you can make a well-informed decision. Have a Set of Ducts Already? Ducts are the series of tubes connected through your attic or crawlspace. They bring cooled or heated air to vents in each room of the home. Some homes are already installed with duct systems, but they can also be installed fresh with a central AC or furnace system. If you already have one of these systems, the most economical thing could be just to install the counterpart. Many homeowners only own a furnace because they’ve previously seen AC as a luxury. In this case, it could make sense to install a central AC into the existing HVAC system. Are You Also in the Market for a New Heater? If so, you might want to use this opportunity to look into a heat pump. This is a system that’s both a heater and an air conditioner in one. They can use the same set of ducts that your furnace or central AC uses, so installation can be a breeze for the right homeowner. 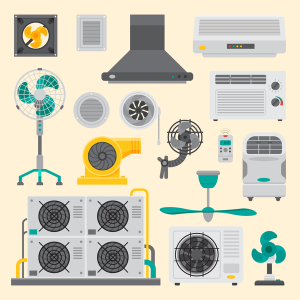 Heat pumps can only use electricity, but they use it much more efficiently than other electric heaters. That’s because they move heat rather than generating it through combustion or electrical resistance. Heat pumps are a little bit more expensive to install up front, but the operational expenses are much lower than other systems. Your investment will pay itself back in a matter of months. “Zone control” is the concept of splitting your home into various sections and then controlling the temperature in those sections. If you or your family members have ever felt strongly about using the AC different in their own rooms, then zone control is for you. One of the best ways to achieve zone control is through ductless mini split heat pumps. This system consists of one outdoor unit and then several indoor air handlers—one for each room of your home. Best of all, each one is individually controlled with its own thermostat. Save on energy by only turning on the units you need to use. Eliminate hot and cold spots (those rooms that refuse to match the temperature in the rest of the home). Heat pumps use electricity very efficiently, so just having them installed will help you see benefits. Need help choosing the perfect air conditioner for your home? (It’s not too early to think about it!) Contact Snellville Heating, Air and Plumbing today to speak with a professional.